A busy and event-filled couple of weeks plus over 600 miles of traveling has brought Frank and I plus Ben and Bayly to our summer home in Wiscasset, Maine. The weather is perfect: sunny and cool and great for working out in the yard and pulling weeds. All of our lovely landscaping made it through the winter and there are lots of blooming flowers everywhere including gorgeous fields of lupines growing wild along the roadside. I packed and mailed 4 very heavy fixed-rate postage boxes of beads and tools and stuffed as much in the car. That should hold me over for the next three months. Or not! There is so much available here in Maine for the crafter...a very artisan-friendly state. Only 10 miles away in either direction is Pine Tree Yarns in Damariscotta, full of wonderful hand-dyed yarns and the owner Elaine, has written several recent books on yarn dyeing and knitting with silks. In Bath there is Halcyon Yarns, chocked full of goodies for spinning, felting and knitting. It's where I bought the big hank of black mohair for my Ireland design project (Chartres Vest)...only $42 for over 1,000 yards. Only 30 miles away in Freeport is Beadin' Path...a fabulous bead shop specializing in vintage beads and so much more. 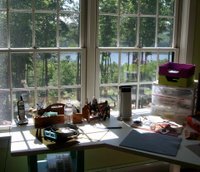 Above is the view from my "studio", a light-filled room with gorgeous view of the Sheepscot River and a 100-year-old railroad trestle which bears several toot-tooting tourist-carrying trains most weekdays during the tourist season. I must admit that I stare out the window a lot! Between weeding and cleaning, I have managed to make a necklace with my little cache-pot earrings to match. The necklace is special as it contains Raku pottery that I made during my lessons at Laura Nichols' Pig Pen Pottery Studio . It also has 12 beautiful borosilicate flame-worked beads: beautiful blues and olives encased in clear glass and a hand-made enamel toggle clasp. 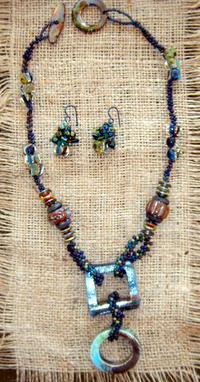 I Peyote-stitched the long loops with cool little irregular shaped fringe beads that look like miniature raku pieces. The earrings each have a borosilicate bead base and about a hundred other funky little beads, too. Regarding the October knitting tour to Ireland, I have had several inquiries of late, and need to say that the trip has been full since February and we have a small waiting list (one person already succeeded!). BTW our knitting trip for next year will be the Isle of Skye and Scotland in late September 2008. We are not yet taking names as the dates are still somewhat tentative.